For those taking the next step and investing in a greenhouse, it can be sometimes hard to find which option suits best. My advice is to find a greenhouse that compliments your garden while also being practical for its intended use. Firstly you should avoid generalising about characteristics of Polytunnels vs Glasshouses (e.g. thinking Polytunnels are stronger than Glasshouses or Vice Versa). There are a huge range of Polytunnels from extremely strong to extremely flimsy and the same applies to Glasshouses. One generalisation one can usually make is that something very cheap is probably very flimsy, and usually to have something strong is going to cost more that something weak. Sometimes customers ask which is better for growing plants – a Polytunnel or a Glasshouse, but if adequate ventilation is provided (and that depends on the features or model you choose) then the growing conditions are much the same. Ultimately this debate boils down to personal choice, so instead of given my opinion on which I think is best I have listed below some pros and cons of both Polytunnels and Glasshouses. I hope this makes your search that bit easier….. If you are looking for something quite large, the difference in cost between a Polytunnel and a Glasshouse is quite substantial. Vegetables particularly take up a lot of space, so a Polytunnel will give you a larger area of protected space to grow for your money than a Glasshouse – all things in terms of strength and ventilation being equal. There is more flexibility to customize your structure to suit unusual needs. i.e. widening the doors for machinery or coping with sloping ground, a Polytunnel is much more easily modified than a Glasshouse. Straight sided tunnels provide a very pleasant working area internally as a result of the height. If your 6’ 2” like me, this is an added plus. It also means taller crops are less likely to be touching off the polythene cover. Although Polytunnel Covers are UV stabilised to give long life, they do need to be replaced periodically (depending on the grade chosen usually every 4 or 5 years, but some customers getting much longer – it depends on many factors such as how much sunlight the cover get. With larger structures this can be a bit of a headache, it requires the customer to think ahead and test the polythene when coming up to its expected end of life so to anticipate when to recover it rather than having the cover fail in the middle of a period of inclement weather. In a glasshouse if you break a pane of glass you can replace that pane. Do the same with Polytunnels cover and you have to try and tape it (not the best or most permanent job). In the worse case situation you might even have to recover the full tunnel if needs be. Prone to attack by cats and dogs (and birds pecking at insects at the ridge). Not the most common of problems however I have heard of it occurring on more than a few occasions. Therefore worth noting if you have pets around. Polytunnels are not an item of beauty to most, so generally people want to keep them out of sight in the vegetable plot. At present there are not as many options for ventilation in Hobby Polytunnels as there are for Glasshouses. Ventilation is usually only supplied by opening doors at both ends whereas a Glasshouse can have roof vents, louvre vents and these can easily be fitted with automatic opening devices which do not need electricity to work. Glasshouses are available in very attractive designs that compliment a garden, such as Orangeries, Victorian style Models and Dwarf Wall Greenhouses, with the frames being available in a range of colours. They do not need to be kept out of sight so can be situated nearer your house and this can be an advantage in terms of making use of it. Glasshouses will need periodic cleaning as do Polytunnels but you don’t need to replace the covers every few years. Aluminum has a very long lifespan and powder coated models protect the aluminium from oxidising and so retain the good looks of the Greenhouse for longer. Glasshouses are available with a wider range of ventilation options than Polytunnels and also there is an abundance of shelving and other accessories for them that are not widely available for Polytunnels. For example rainwater collection from a Glasshouse is simple as they nearly all have built in gutters, it is just a question of ordering downpipes and a water barrel for it. A flat and level base is required for a Glasshouse, so generally speaking the preparation of the site is a bigger job than a Polytunnel. The lead time for supplying some Glasshouses can be up to 3 months, so you need to plan ahead (unless it’s a standard model, these are normally in stock by glasshouse suppliers). 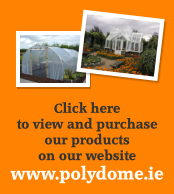 Most Polytunnels that are produced in Ireland can be manufactured within days of order. Joking apart, many customers get both a Polytunnel and a Glasshouse. The Polytunnel is at home in the vegetable patch out of sight, doing a fantastic job of protecting the vegetables from excess rain and wind, providing excellent growing conditions, the Glasshouse up near the house, a feature in the garden and used for propagation, flowers, bedding plants and perhaps a few tomatoes. So the question does not have to be Polytunnel or Glasshouse, it can be which Polytunnel and which Glasshouse (probably not all at once).